Most airlines look for ways to gain extra income to cover for their low-cost flights. They do this by offering you snacks, letting you use their toiletries, or charging for the extra pounds from your luggage. For this reason, it is important to invest in the best luggage scale in order to avoid this extra fee. Luggage scales are used to accurately check the weight of your bag or suitcase before going to the airport. You can usually find it in a hook type design where you will hook your bag on the scale, lift it, and it will show you the accurate weight of your bag. Another design of a luggage scale is one that you place on the floor. Then, you simply put your bag on top of it. However, this is not used often because it does not give an accurate number. Why Buy a Luggage Scale? Buying a luggage scale is important in making sure that you don’t exceed the luggage limit of an airline, especially for those who are jet-setters. By having a luggage scale handy on your every travel, you can always check that you’re within your luggage allowance and avoid getting extra charges. The ideal luggage scale should be portable, lightweight, durable and long-lasting. Luggage scales are essential as a travel accessory. With this instrument by your side, you will be confident about the weight of your luggage. While all luggage scales have the same function, the key is to find the one with the best bonus feature. 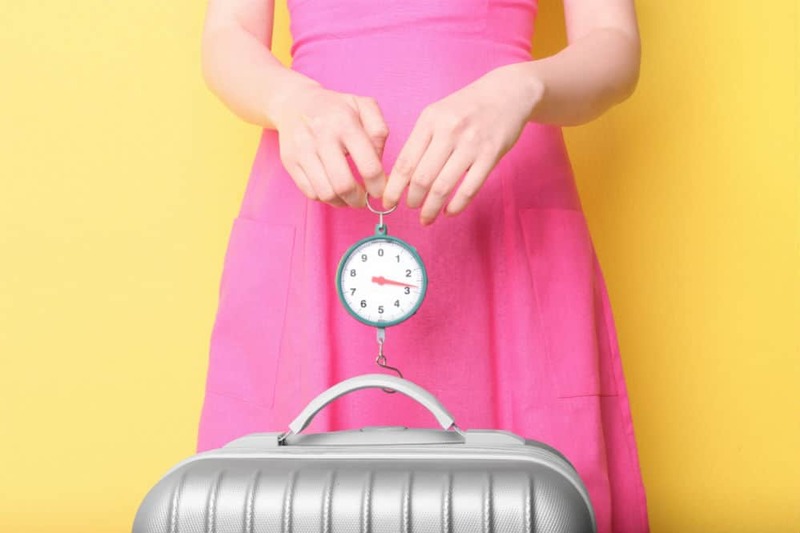 The Etekcity Digital Hanging Luggage Scale is perfectly designed for travelers who want to save money and have no stress when traveling through the air. It requires no setup, has a weight capacity of up to 110 pounds (50kg), and can weigh almost anything you hook it up to. This luggage scale has a tare feature as well, which you can easily use to measure the weight of individual objects. You can also convert the results from pounds to kilograms and vice versa without any unnecessary buttons to push. 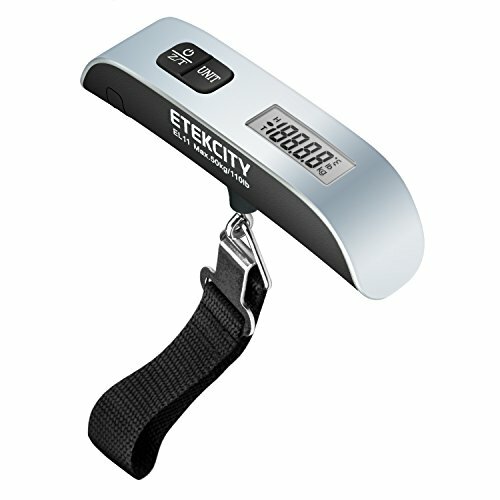 In addition to that, the Etekcity Digital Hanging Luggage Scale also boasts a temperature reading feature. It can measure both in Fahrenheit and Celsius for you to know the current temperature of your delicate souvenirs. 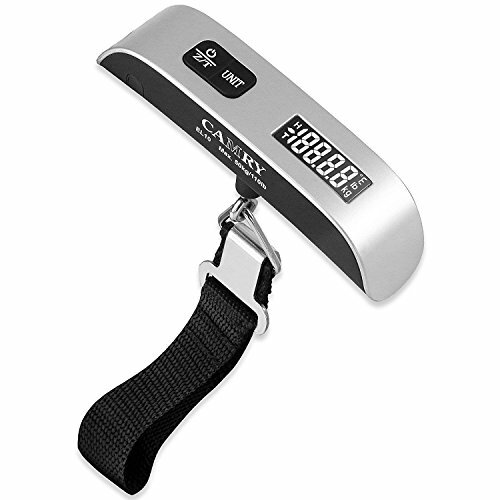 This luggage scale has a rubber paint technology and textured hand-grip utilized for you to easily handle it when you’re about to weigh in your bag. It’s also equipped with a clear digital LCD display along with an overload and low battery indications. Plus, a lock weight feature for you to easily record and differentiate your weighing times. Its auto-off and tare function will allow you to preserve both the battery life and your time. Its dimensions are 5.1 by 1.6 by 1.2 inches, and it weighs 4.2 ounces. The package already includes one Lithium-ion battery. The Camry Digital Luggage Scale made it to our top three because of its sensor technology and ability to accurately check the weight of any bag or suitcase. It has a weight capacity of 110 pounds or 50 kilograms and precision accuracy of 0.1 pound or 0.05 kilogram. This luggage is designed with an easy and simple two-button operation and a large 1.4-inch LCD screen. Aside from that, it has a temperature checker feature in both scales of Fahrenheit and Celsius for you to know the temperature of the objects in your luggage. It has an automatic two-minute auto shut-off feature for time-saving advances as well. This instrument is powered by a single piece of 3V CR2032 Lithium battery, which is already included in the package. It has a strap-and-clip design that can fit any strap of luggage or bag. You can easily weigh in your luggage because of its rubber paint handle. Plus, it has a zero and tare function as well as overload and low battery indicators to allow for a much more hassle-free experience. The dimensions are 5.1 by 1.2 by 1.6 inches, and the total weight is 1.12 ounces. 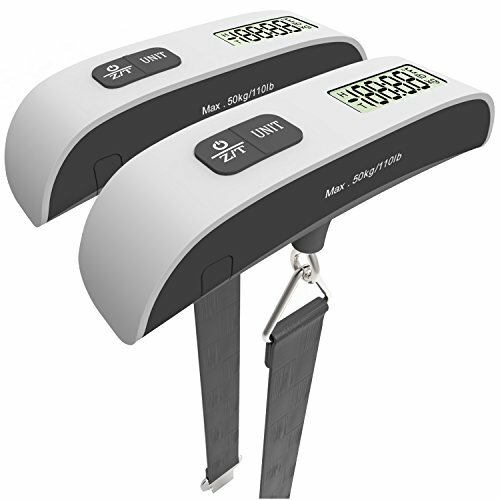 The MagicPro Digital Luggage Scale will save you time, energy, and money because of its accuracy and easy-to-use technology. It comes with two luggage scales so that you can easily leave one behind your home and the other one constantly on your person. Similar to the two previous choices, this luggage scale can also accurately measure up to 110 pounds or 50 kilograms. It has a precision capacity of 0.1 pound or 0.05 kilogram too. Moreover, this luggage scale has a clear digital LCD display too, wherein you can easily see the overall weight of your luggage. This screen will also show you when your luggage is over the intended weight or when the device has a low battery. As an added bonus, this instrument will also show you the temperature scale in Celsius and Fahrenheit. With this feature, you’ll know if your souvenirs are in the right temperature. This luggage scale is made with a textured hand grip and rubber paint technology so that you won’t feel any pain when you’re weighing your bags. This also allows the instrument to be durable and can withstand the long pressure of weighing. It has a tare and auto-off feature to save its battery life and save you from constantly having to buy a new one. The product dimensions of these luggage scales are 6.3 by 4.4 by 3 inches, and they have a total weight of 10.6 ounces. Looking for the best luggage scale can be a difficult task because most of them have the same features. However, among the three products that we have reviewed above, we believe that the best is the MagicPro Digital Luggage Scale. Not only does it accurately measure your luggage and has great handy features, but it also comes with two products so that you can leave one at your home or gift it to a friend. Now, that is value for money!